In 2009, I created a first version of The Fall of the Snow Fairies: A Winter Ballet. I have since set and reset multiple versions of the concert. 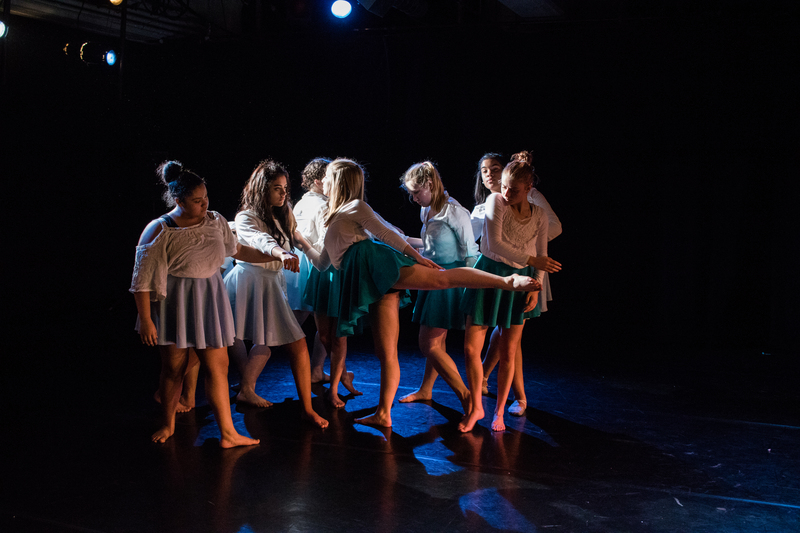 Setting the work on Danceworks Youth Performance Company will be the seventh time the story has been danced to life! DYPC’s “Enchanted.” Photo by Christal Wagner. It all began with a story. I have written stories for children since I was a youngster myself. I’ve always had a wild imagination, flair for the dramatic, and a love of great adventures! Still do 😉 As a child, I would write about everything from scary stories and dinosaurs ruling the earth to the conversations that go on between your favorite foods in the fridge. As I began to study dance intensely, I soon had less less time for recreational reading and writing. My hobbies were on hold as I needed to dedicate a great amount of life to focus on my craft, developing my artistry as a mover and choreographer. I have always had a love of the theater and an extreme connection to cinema. Images in films resonate with me strongly as my dance concert concepts are often strongly inspired by movies, soundtracks, and classic themes. In recent years, it has become clear that my love of storytelling is still very present as I create several danced stories per year for young artists to tell through movement. The Fall of the Snow Fairies was first just a spark of an idea that developed into a 40 minute performance first occurring in my hometown of Kenosha. After receiving a enthusiastic response from involved participants and their families, I decided to make the ballet an annual event. A contemporary ballet sort of Nutcracker, if you will. The production first premiered with just a core cast of about twelve performers. Five performers dance the roles of the Snow Fairies. They are the glow of winter. Kind, friendly, and beloved, the Snow Fairies desire peace and for all to experience the magic of winter. Their movement is light, airy and delicate. In the performance you may notice a fluttering gesture often performed with their hands. Imagine that this gesture symbolizes flight and sprinkling the land with snow. Two performers dance the role of the related characters, the Ice Pixies (Syrena Hjelmgren & Tess Oldenborg). The Ice Pixies accompany, protect, and guide the great adventure through unknown lands. Five fiery movers dance the part of the Dark Fairies. The Dark Fairies hold an ancient grudge against the innocent Snow Fairies and wish to rule the lands, burning out the magic of winter throughout the land of Foria. The Dark Fairies’ movement is aggressive, fierce and often abstract. In the 2018 version, the Dark Fairies are led by an evil king, King Damien (Dave Valuri). You may notice that the Dark Fairies often perform non-classical rib cage movement woven into their classical steps. The evil characters also perform gestures throughout that appear to convey a snootiness, demonstrate an air of regality, and symbolize a desire to control. In the story, Bela, danced by DYPC’s Vivian Foster, must go on a great journey to save her family of fairies from the wrath of the Dark Fairies and King Damien. At first, the family of fairies thinks that Bela’s playful dancing resulted in the King discovering their whereabouts. 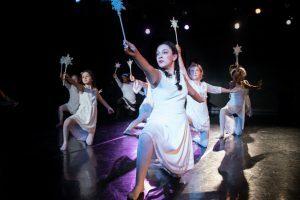 While the Snow Fairies were fast asleep, the King’s Minions (Danceworks Minis) crept upon the branch of the tallest tree to find their arch nemeses fast asleep. The Minions run off to announce their findings and return with the Dark Fairies and King Damien. One by one, they pluck the fairies from their home! Bela is full of grief but, with the Ice Pixies by her side, is able to cross unknown lands to free her family from the evil and save the Spirit of Winter. To begin the show, the audience witnesses a glimpse into the history between the Snow Fairies and the Dark Fairies, the relationship between good and evil. The Seasons, danced by the Danceworks Juniors, begin to tell our tale to the eager Snow Babies and Snow Children. This role is traditionally danced by young movers ages 3-8 years old, and this version has a lovely group of 24 Danceworks students participating! Throughout the story’s many versions, characters have been added along the way. The story started with just the twelve dancers but is now danced by over 40 dancers of a variety of ages. Each chapter of the adventure allows for different dancers of different ages and experience to shine. Characters have been added with every retelling to enhance the obstacles the heroines must face. As you watch the performance, I invite you to look for the many layers of ages and abilities in each scene. Pay particular attention to the scene with Seasons and Snow Children, Winter Winds, and Water to see the way different scenes are coordinated and elements of the story are told by different dancers of with varying levels of experience. I often first rehearse each element separately, then schedule combined rehearsals for the dancers to become comfortable with one another and confident with the layering of information. It is a challenging process but very rewarding to see dancers become leaders, role models and develop friendships all while working together to complete a work of dance! 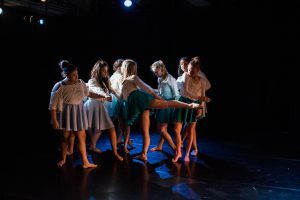 During the winter of 2008 and 2009, I had first crafted the outline of the epic tale and started to think about my then youth company of dancers bringing the tale to life. Those who first danced the roles will always have a special place in my heart, and so I started a tradition of creating fantasy names for characters based off of real names of performers. Every time I create a new story to be danced, or create a new character, I name the featured characters after the performer’s real name. I think this helps the dancer to have a deeper connection to the role, appreciate the history and evolution of a work, and creates a stronger memory for all involved. 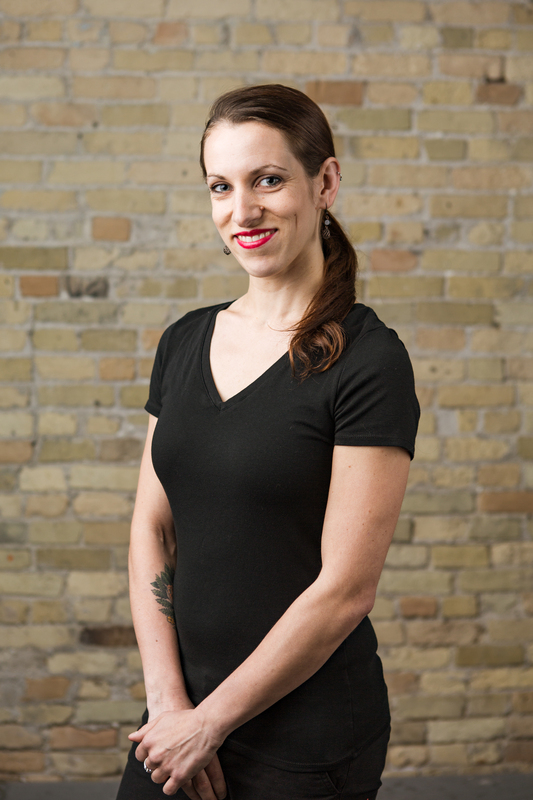 Tess Oldenborg’s character was named Tabitha in The World in the Red Suitcase (Danceworks’ 2018 Studio Showcase) and Syrena Hjelmgren and Julia Schuessler danced the parts of Selma and June as they became lost in Within the Labyrinth (DYPC’s Spring Concert of 2018).